Two screens and it's called Alex - what's not to like? Spring Design has released a new type of e-book reader - the Alex - one with a normal E-ink display and an Android device built into the base. 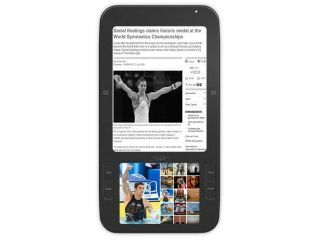 Featuring a six inch e-ink display and a 3.5-inch LCD screen below, the Alex allows users to view books and text normally on the upper display and then see secondary content in the smaller window. Similarly if you're browsing the web in the lower section and want to read something in more detail, you can transfer it up to the e-ink display and therefore save battery life too. However, it seems the Alex's success is based on creating a n ecosystem that doesn't currently exist. Spring Design says it is "potentially igniting a whole new industry in multimedia e-book publishing for secondary authors to create supplementary content that is hyper linked to the text." The company says it has been working with book stores, newspapers and publishers over the past two years to get such an ecosystem in place, with 'Web grabs' designed to augment text and pictures from the main display. It uses both Wi-Fi and 3G networks to connect to the internet, but it won't be using the full force of Android - such as the Market - as it's only based on the minimal version of the OS. Spring Design aims to have the Alex in selected markets with strategic partners by the end of the year, so we have no word on whether it will come to the UK at this point, although it may be released with a partner - such as a bookstore or newspaper - to take e-books further.